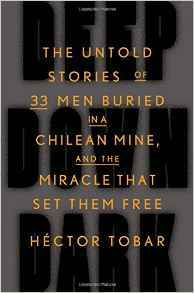 Remember those 33 Chilean miners who got trapped underground in a mine disaster back in 2010. This is their story and it is gripping read about the human spirit. It all happen because a rock fell and blocked the only tunnel out of the mine. A large rock, a rock the size of a skyscraper they called the megabloque. It was during those first 17 days, before the first bore hole reached them and gave them contact to the world, that were most difficult. There was little food and so they were all slowly starving to death. The single meal for the day may be a spoonful of tuna or a biscuit. As time dragged out it was 2 or 3 days between these tiny meals. When they found a single peach slice they missed from a previous meal, they sliced it into 33 tiny portions to share. During those 17 days they banded together, prayed together and helped each other out. Although there were some factions among the group, there was a sense of unity. When the rescuers make contact, and starting supplying food, water and information through the bore hole, that is when the unity started to crack. These simple working men became instant celebrities. And millionaires too, after the richest man in Chile gave all the miners a million dollars while they were still trapped underground. (Note - In Chile a million pesos is not a lot, maybe a couple of year's salary). Finally after 69 days they were hoisted to the surface but that was not the end of their story. Survival didn't stop when they escaped the mine, it continued on in the years that followed. Some lost their money because friends and relatives where constantly begging for loans they never paid back. Most suffered PTSD. One would sit at night in the dark living room with his miner's helmet and lamp on. Those that got jobs straight away and carried on with a normal life seemed to cope the best. For a survival aspect, it is the way the group interacted that is fascinating. For that reason alone the book is worth reading. Plus I discovered a new word, borborygmus, the scientific name for tummy rumbles, which can be a very loud sound when they are 33 of you starving. Bite off more peach slice than you can chew.